Rising Higher: A Research Lab Built from the Ground Up. Part 1. Rising Higher: A Research Lab Built from the Ground Up. Part 2. Scores of invasive species have found their way into our Great Lakes, creating a significant challenge for natural resource managers who must respond. Although many of these new species do not pose a serious threat, some become "invasive" and inflict significant costs to both the economy and the environment. Natural resource managers need scientists to develop a strong understanding of these new species, along with strategies and tools to aid in managing or eradicating them. 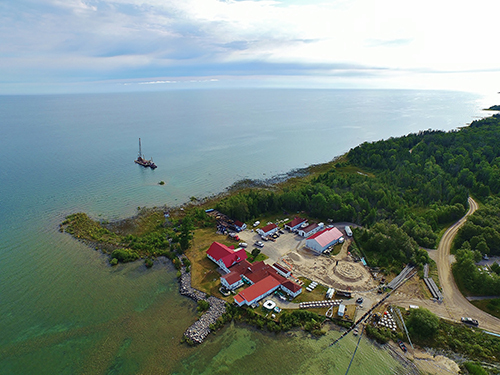 To meet this need, a state-of-the-art invasive species laboratory is being built on the shores of Lake Huron at the United States Geological Survey Hammond Bay Biological Station (USGS HBBS). 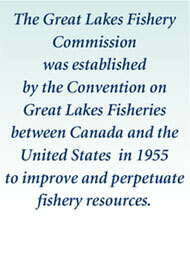 The biological station is one of seven field stations of the USGS Great Lakes Science Center, and is operated via a decades-long partnership with the Great Lakes Fishery Commission. HBBS has a rich history of research on aquatic invasive species, particularly sea lampreys, which are ancient, parasitic fish that devastated Great Lakes fisheries in the mid-1900s. Much of the pioneering research on sea lamprey control occurred at HBBS, including development of lampricides, the primary control technique. The sea lamprey control program in the Great Lakes is recognized internationally as one of the most successful, wide-scale, science-based invasive species programs in the world. The program has achieved a 90 percent reduction of sea lamprey populations in most areas across the vast Great Lakes basin, which saves more than 100 million pounds of fish per year. The new 7,600 square foot laboratory facility at HBBS will provide a 21st century platform for research on invasive species and is expected to attract the world’s top invasive species scientists. The new laboratory will replace an aging facility of the same square footage constructed piecemeal over the course of five decades. The new facility will include laboratory space for chemistry applications, physiological research (i.e., the study of how organisms function), and bioassays (i.e., studies which assess the effect of various treatments on organisms). The facility will also contain multiple raceways that will serve as experimental streams where researchers can test techniques before application in the wild. 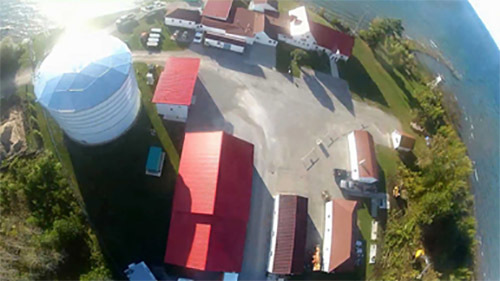 A one-million gallon water tank, pump house, and pipeline from Lake Huron will supply water to the raceways and the many fish holding tanks in the new facility. After the new laboratory facility is completed, the old laboratory facility, built just feet from the water, will be demolished. During the final stage of construction, part of the main building will be renovated to include an interpretive entryway designed to educate the hundreds of children and adults who visit HBBS each year. Out with the old, in with the new! To make way for the new laboratory, four old buildings on the HBBS property needed to be removed. Three buildings—a former limnology laboratory, workshop, and metal building—were demolished, while one building—a nearly 100 year old boathouse—was relocated on the HBBS property for safe-keeping away from the bulldozers, excavators, and cement trucks descending on HBBS for construction. 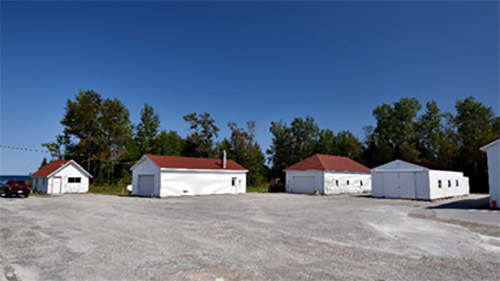 The limnology laboratory (constructed in the 1930s) and boathouse (constructed circa 1930) date back to the days when the U.S. Coast Guard housed its Hammond Bay Station on site (the station was decommissioned in 1947). Originally used by the Coast Guard for a variety of human life-saving operations, the buildings were repurposed by HBBS staff starting in 1950 when the biological station was established for another sort of life-saving activity—saving native fish in the Great Lakes from the menace of the sea lamprey, as well as saving the livelihoods of thousands of people across the Great Lakes basin involved in the fishing industry. To some of the HBBS staff, demolition and relocation of these buildings were bittersweet, as spaces which were part of the HBBS history for decades were lost. To others, demolition and relocation were revitalizing, as these buildings—long past their prime—were cleared to make way for a new laboratory which will provide an exceptional foundation for future HBBS science. Regardless of perspective, we all recognize the role that the newly removed and relocated buildings played in the groundbreaking work that has occurred at HBBS through the decades. Dr. Vern Applegate, considered the "father of sea lamprey control," conducted a variety of limnological analyses in the limnology laboratory. More recently, the "limno building" was used as office space for numerous graduate students and assistants following in the footsteps of the early HBBS scientists. 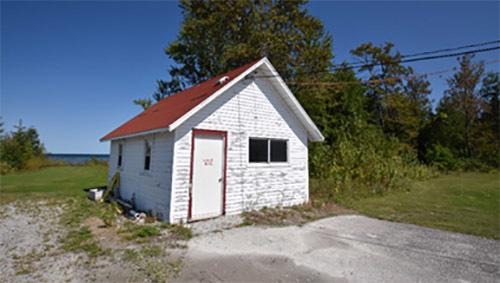 The workshop (constructed circa 1950) was a place where research ideas became reality—where visions of new trap designs and sampling equipment came to life. The first traps used to collect sea lamprey were constructed in this workshop, and many new pieces of equipment were created or adapted in the space. The metal building (assembled sometime in the mid-1900s) intermittently housed lampricide development activities, and more recently has housed a variety of research equipment and documents. The former Coast Guard boathouse is one of the oldest buildings on the HBBS property. 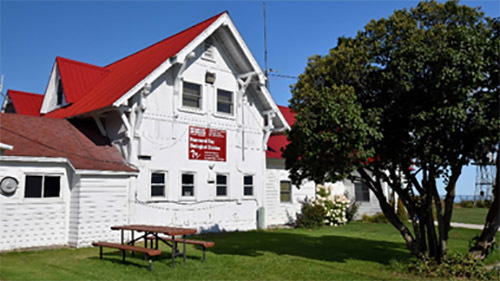 The only older building is the original U.S. Life-Saving Service boathouse (constructed in the 1870s), which now serves as the primary office and administration building at HBBS. When the Coast Guard boathouse was first constructed, the building was located on the water and rescue boats were stored inside. Soon after the establishment of HBBS, the boathouse was moved across the property to store research vessels and equipment. 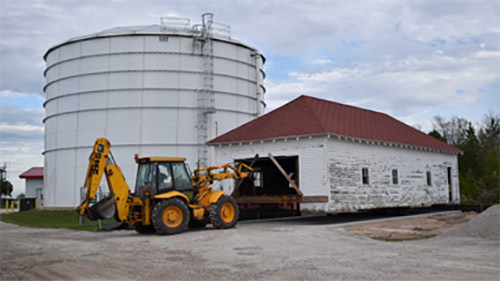 After local citizens expressed a desire to see the boathouse and its history preserved during construction of the new HBBS laboratory, the USGS agreed to relocate the boathouse. During October 2017, the construction crew lifted the boathouse from its foundation using hydraulic jacks, then pulled the building across the property using a backhoe, finally carefully positioning the boathouse just outside the main entrance to HBBS. And so the history of the boathouse continues! Part 2 of the time lapse video series shows the demolition and relocation of the four buildings, as well as preparation of the demolition site (including tree removal and asbestos abatement in the workshop prior to demolition). Although the video spans 20 days, the demolition occurred within a few hours on a single day. Similarly, the boathouse was relocated in a matter of hours. And just two days after completing the building demolition and relocation, the construction crew was already at work building the new lab.